Did you know that house injuries are one of the top reasons kids under 3 visit the E.R. each year? Babyproofing your home is essential to keep your baby safe. Supervision is the best way to prevent injuries, but even the most vigilant parents can’t keep their children completely out of harm’s way every second of the day. So it’s smart to be prepared, especially before your little one starts crawling and getting around the house on his own! Although it may seem odd to start thinking about baby proofing if your little one can’t even roll over yet, you’ll be amazed at how soon he’ll start wandering around the house. Don’t get caught unprepared! As a first step, don’t assume your baby sees everything the way you do. Remember he is on a very different level –ground level. To avoid overlooking any hazards at home within easy reach try crawling on your knees around the house. It may seem silly at first, but it’s actually one of the best ways to keep your baby safe and see if you’ve missed anything. TV and Furniture: Use furniture straps to hold the TV, unstable walls, tables, dressers, and bookshelves. Avoid having a TV on top of a dresser, children can use drawers for climbing. Sharp Edges: Remember to put edge bumpers on all sharp corners and on any furniture with sharp edges. Cabinets and drawers: Place all household chemicals and cleaners in locked cabinets, or place safety latches that lock when you close a cabinet/drawer. Cords: To avoid your baby from tugging on computer or TV cords, use cord holders to keep them secured against the walls. Prevent Shocks: Place outlet covers on all visible electrical sockets. Cribs: Make sure your baby can’t place his head between the slats and that it has stable rails. To confirm that the slats are not too wide, grab a soda can and slide it through; if you can do it, it means they are too wide. Additionally, avoid any cribs with drop-side rails, these are now banned. Soft Bedding: While blankets and soft-bedding sounds cozy and sweet, they can be very dangerous for your baby. The AAP says parents should keep soft objects and loose bedding away from infants because they can inadvertently lead to suffocation. Your baby should sleep on his back and on a firm mattress covered with a tight mattress pad and sheet. Remove any comforters, thick bumper pads or soft toys on his crib. Bath time: Put non-slip strips on the bottom of the tub and a soft cover on the faucet to protect your baby’s head. Never leave your baby or toddler alone in the tub. Gates: Remember to place baby gates to keep your little one away from stairs (top and bottom) or out of certain rooms. Don’t use accordion-style gates, look for one that attaches securely to a wall but won’t pinch small fingers. Windows: Place your baby’s crib and furniture away from windows. Don’t rely on window screens – they protect us from insects, but not from children who lean on them. Instead, place childproof screens or window guards to prevent falls. Toy Safety – As a rule of thumb, your little one’s toys should be larger than his mouth to prevent choking. Always check the toy thoroughly for detachable parts like eyes or other items that can be easily torn off and become a choking hazard. 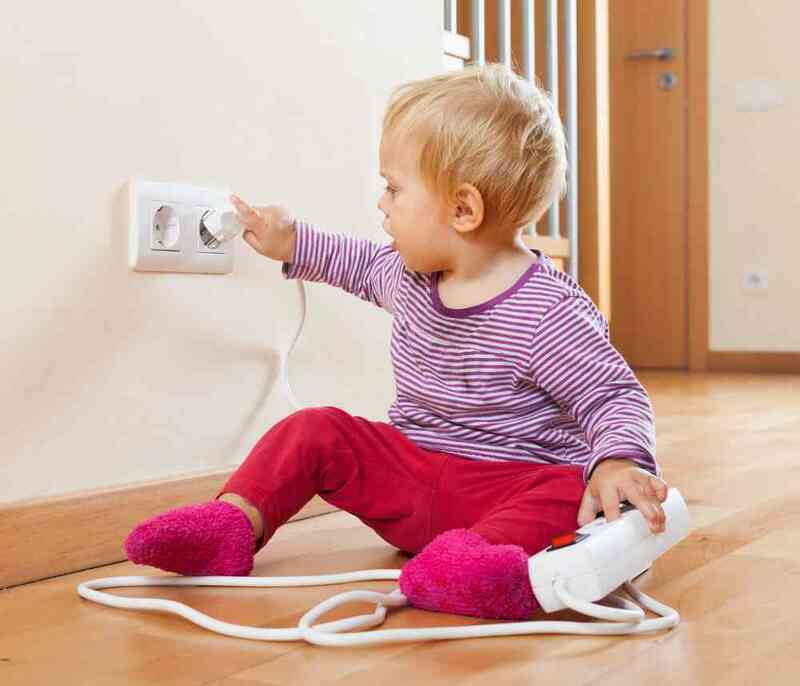 Appliances: If you are used to leaving your toaster, coffee maker, printer, TV, or computer plugged in, remember some can harm your child if he pulls them or gets tangled in a cord. Unplug them and store away their cords when you are not using them. As a first step, don’t assume your baby sees everything the way you do. Remember he is on a very different level – ground level. To avoid overlooking any hazards at home within easy reach – here is a little tip: try crawling on your knees around the house.